We're putting Baidu and Facebook through a three-part analysis to see which name investors should consider today. It may be easy to assume tech giants Facebook (NASDAQ:FB) and Baidu (NASDAQ:BIDU) share little in common. 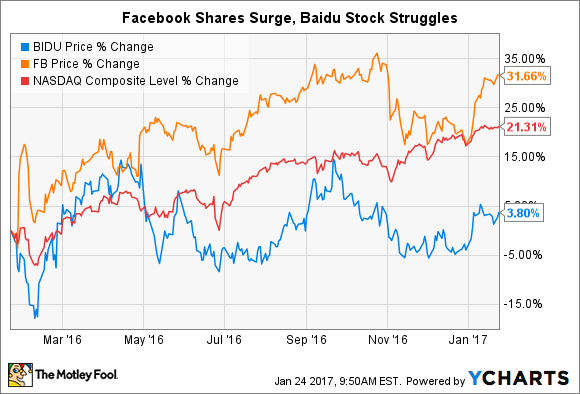 The divergent fortunes of Facebook and Baidu shares over the past year only reinforce their apparent differences. However, though their core businesses today touch different areas of the global technology market, Facebook and Baidu are united in their ongoing efforts to shape some of technology's most important future growth markets. So, which is the better buy today: Facebook or Baidu? In this article, we run both companies through a three-part analysis to get a clearer sense of which stock appears more attractive right now. Thanks to their dominant market positions, Facebook and Baidu both enjoy rock-solid balance sheets, as you can see from the following chart. Data sources: Yahoo! Finance, Facebook investor relations, Baidu investor relations. However, a few clear points emerge here that put Facebook's financial strength truly in a league of its own. The company's $26 billion net cash position -- think cash and investments minus debt -- totals nearly twice Baidu's $15.6 billion total. Importantly, Baidu's multibillion-dollar net cash holdings are quite impressive in their own right, especially when compared to companies from other industries. However, Facebook's business model is simply so profitable that it certainly beats Baidu in a category where few companies can. Similarly, the five-to-one advantage Facebook holds in terms of its cash flow generation is enough to make this round a no-contest. Baidu and Facebook both dominate their respective markets. Though you can measure it several different ways, Baidu clearly controls the bulk of the Chinese search engine market both in terms of revenues and search volume; it is the fourth most popular site globally and the most visited site in China. Similarly, Facebook is easily the world's largest social network, and its share of U.S. online ad-spending is second only to Alphabet's Google search engine. Either company would be tremendously difficult to dislodge from its leadership position in its core market. So, in terms of current competitive advantages, it's safe to say that Baidu and Facebook both enjoy them in spaces. Furthermore, Baidu and Facebook have been investing in technologies that should underpin our increasingly tech-laden futures. Much of Baidu's recent profit margin contraction is the result of its increased spending on what it calls "Transaction Services," which includes online-to-real-world products like online food ordering, Groupon-esque group buying sites, online movie ticket sales, and more. Moreover, Baidu has invested aggressively in AI technologies across a host of applications from improving the quality of its search results to pioneering driverless car software in China. In addition to its notable emerging communications investments -- WhatsApps, Facebook Messenger, and even arguably Oculus, though it's not strictly for communication -- Facebook has also invested headlong into artificial intelligence. Its Facebook Artificial Intelligence Research (FAIR) arm is designed specifically to attract top academic minds to make major breakthroughs in AI technology, though the company already applies AI to its social network and other businesses in ways large and small. At the end of the day, Facebook and Baidu are two of the most powerful tech companies in the world, so let's call their equally dominant competitive stances a tie and move on. There's certainly quite a bit of noise when it comes to comparing Facebook's and Baidu's valuations. Here's a quick snapshot of three widely used valuation statistics for each company. Baidu's glaringly cheap 13.3 current P/E ratio probably jumps out, here, but don't get too excited. Baidu's Q4 2015 earnings were inflated by $3.8 billion by a one-time gain from the company's share exchange of its Qunar stake with Ctrip; for comparison, Baidu's Q4 2015 operating profit totaled $1.8 billion. Turning to their forward earnings multiples, Facebook's continued earnings growth begins to shine through, which is the crucial distinction between the two in my eyes. In fact, the analyst community holds an altogether bleak view of Baidu's medium-term earnings growth story, calling for the company's EPS to contract by -1.7% annually over the next five years. Though I don't hold nearly as bearish a view on Baidu, Facebook's expected average annual EPS growth rate is an impressive 35% for the next five years. Considering this meaningful disparity in earnings outlook, it seems that Facebook's valuation makes it the more compelling option in this category. Winning two of the three categories examined here, Facebook earns itself a win over Baidu as the better buy today. To be clear, though, both Baidu and Facebook are incredible growth stocks. In fact, these two companies are among the most highly recommended names in the Fool's premium newsletter business -- and for good reason. Baidu dominates an important and profitable segment of the Chinese technology market, and its investments in emerging technologies should only strengthen its future market position in the world's most populous country. Facebook is also thriving in the present by nearly any conceivable metric, while also working diligently to position itself to benefit from coming tech trends. So, while both Facebook and Baidu are indeed worthy of investors' adulation, Facebook deserves credit as the more attractive stock to buy today.